The fifth and final monument of the year, the ‘Race of the falling leaves’ also marks the end of the UCI World Tour for 2016. Last year’s winner Vincenzo Nibali won’t be contesting the win, which isn’t a huge surprise given his imminent departure from Astana. The race also marks the climax of a frantic series of races in Italy at this time of year, very much seen as preparation for Il Lombardia. We have seen Miguel Angél Lopez (Milano-Torino), Sonny Colbrelli (Tre Valli Varesine, Coppa Sabatini and Coppa Agostoni) and Esteban Chaves (Giro dell’Emilia) all take wins, so they will be ones to watch on Saturday. The timing of this year’s race has also been brought forward by a week, due to the World Championships in the hot deserts of Doha, in an attempt to avoid unraceable temperatures (unlikely in our view! ), and as it’s a course favouring sprinters the potential conflict of riders wanting to ride both will be minimal. That also means that it won’t have that ‘rainbow revenge’ feel that it has done previously when the World Championships course has favoured the climbers. An interesting subplot to this race worth following will be watching teams and riders take on their final chance to bag World Tour points. Sagan has the individual title sewn up as he, and the only other rider able to beat him Nairo Quintana, aren’t even on the start list. However, in the team classification Tinkoff could overtake Movistar and break the Spanish team’s 3 year winning streak, which would see the Russian team win the overall days before being disbanded. They are only 70 points behind, and, with 100 points on offer for the win, it’s all to play for, if Alberto Contador, Roman Kreuziger and Michael Valgren are motivated to deliver for their future ex-employers. At the other end of the league table Dimension Data, surprisingly, have a fight on their hands not to be cut from the World Tour next year , with the UCI wanting to reduce the number of teams from 18 to 17 whilst also accommodating the likely inclusions of the Bahrain- and Chinese-backed teams set to replace IAM and Tinkoff. They need 130 more points than either Giant or AG2R to not win the wooden spoon. So expect the African team to animate the race and look for a surprise win for any of Edvald Boasson Hagen, Igor Anton, Omar Fraile or Serge Pauwels. The timing isn’t the only change, with this year seeing the race organisers switching the start and finish towns, with the 2016 edition starting in Como and finishing in Bergamo – the reverse of last year’s race, and replicating the route of the 2014 race, in which Dan Martin triumphed. 2015 was seen as the hardest course yet for the race but if anything the 2016 course looks to be even harder. The only point worth mentioning in the first 120km is the climb up to the shrine of Madonna del Ghisallo, the patroness of cyclists, after 64km. The shrine also contains a small cycling museum, in which burns an eternal flame for cyclists who have died, notably that of Fabio Casartelli, a native of the region, who died in a crash in the 1995 Tour de France. His crumpled bike is poignantly on display. Once the riders pass the 130km mark the racing will begin in earnest. 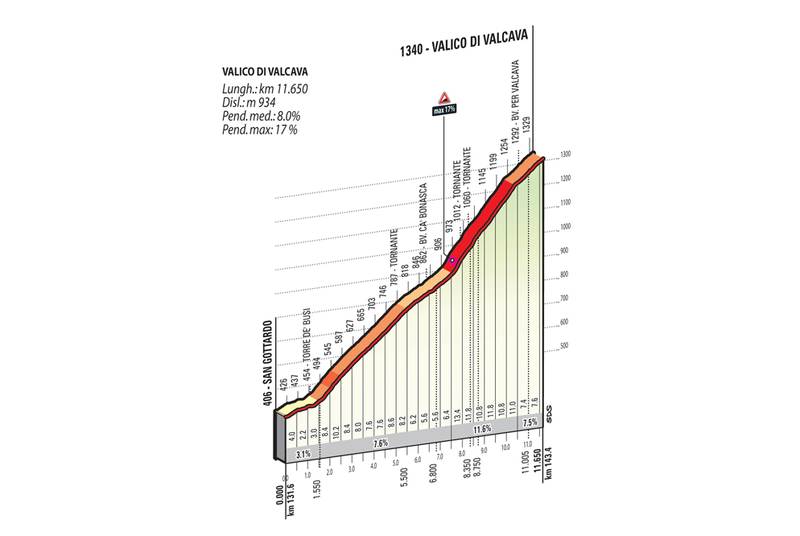 This marks the approach to the longest and hardest climb of the race, the Valico Di Valcava (11.6km, 8%, 17% max). 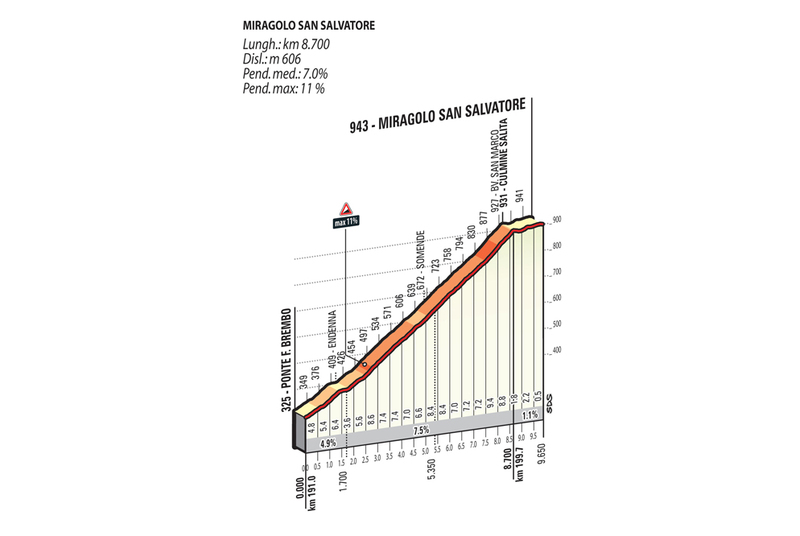 It starts off at a steady and manageable gradient, with an average of 7% for the first 8km. Straight after this is when the riders will hit the max gradient of 17%, with the following 3km averaging 11%. This is where we should see the first splinters within the peloton. The descent will also likely be full of riders trying to force an advantage, for as soon as they reach the foot of it they will begin ascending the first of four short but sharp successive climbs. 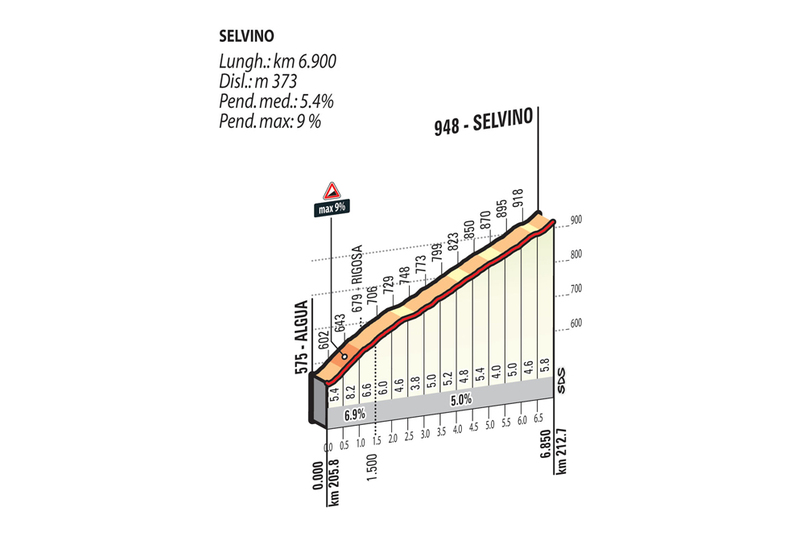 A huge amount of damage will have been done over the five climbs, and it’s almost certain that either a lone rider or very small group will crest the Selvino. At which point there will only be 28km remaining. The descent down from the Selvino is 12km (twice as long as the climb itself) and we will no doubt see multiple attacks by those riders confident they can handle high speeds along the long sweeping bends. With 16km to go the riders hit flat roads for the first time since the 100km mark but, as is now seemingly custom in races this year, there is one last lump in the road coming just after 5km to go. The Bergamo Alta climb (1.7km, 7.9%, max. 12%) is short but sharp and, mimicking the final climb in this year’s Liège-Bastogne-Liège, it contains sections of pave. This will be the likely scene of the final attack or attacks from riders wanting to steal a solo victory. This is the same finish as used in 2014, and while it didn’t have an impact then, it also didn’t feature the preceding series of five climbs, which will have taken their toll on the riders’ legs. A 2.5km descent follows, which while it isn’t overly technical, does contain a number of bends, which will make chasing down any lone attacker difficult. The final turn will see the riders enter a 250m flat stretch to the finish, in which a very tired sprint could be contested between a handful of men. As usual a mix of climbers and puncheurs will battle it out for the win, but with the increased level of climbing featured in this year’s edition the course certainly favours the lighter mountain goats of the peloton. Let’s take a look at who we fancy — and there are many to choose from! Orica-BikeExchange have the two in form riders coming out the Vuelta in the shape of Esteban Chaves and Simon Yates Yates is now not included in the final startlist. As mentioned above, Chaves has already picked up a win in Italy this month at the Giro dell’Emilia and will be the team leader for this race. However, it’s likely that Yates will have more of an equal role in terms of leadership and the team will probably decide out on the road who is their best bet for the win. Both riders on the podium is also a strong possibility. Cannondale Drapac have had a fairly dismal year and are winless in the World Tour. Rigoberto Uran has looked in good form and was third at this week’s Milano Torino and Giro dell’Emilia. Can he save the team’s season? We’re confident on that bet. He does have good support in the shape of Michael Woods, Tom-Jelte Slagter, and Davide Formolo, all of whom could feature in breakaway moves and, depending on whether Uran is still in the picture or not, could look to launch attacks from way out with a view of a solo win. This will be the last time we see the pink lycra of the Lampre-Merida, riding with Rui Costa and Diego Ulissi as joint leaders. Neither is a favourite but we fancy the Italian as an outsider, who has seven top tens in his last eight races and would dearly love a big win in his home monument, one that suits his style. Etixx QuickStep have another monster one-day squad for this race. Joint leaders Julian Alaphilippe and Daniel Martin will reprise their Ardennes roles, which showed them working well together in the final stages of the race. Home favourite and Giro and Vuelta stage winner Gianluca Brambilla is also a big name to watch here. The team is really spoilt for choice and all three are genuine podium bets. Petr Vakoč will also be a strong support rider and a decent plan D if it comes to it! Movistar have last year’s runner up Daniel Moreno who will be hoping to go one better here and will likely be the team’s leader after a year of working for Alejandro Valverde — who also cannot be ignored in a race like this. Giovanni Visconti will likely head off in the early breakaway and play a key role for the two Spaniards later on in the race, but if allowed could also contest for the win from a late attack or if the breakaway sticks. Trek have two riders who showed themselves at the Tour and Vuelta this year. Bauke Mollema finally looked like delivering on his promise of being the next Dutch GC hope, only to fail due to crash in the rain on Stage 18. However, he followed this form up one week later with his biggest win of his career at San Sebastian. Fabio Felline was one of the most consistent riders at the Vuelta with six top tens. His climbing has improved and he has a kick in a sprint to the line so if he can stay with the favourites he could be hard to beat in the finish. AG2R also have a strong roster for this race. Their leader will be Romain Bardet, who will be no doubt look to exploit an advantage on the multiple descents of the course of the race. He’s not the fastest on the flat though, so he will be working for a solo win. Jan Bakelants and Pierre Latour were both aggressive at the Vuelta. Bakelants would favour a win from the breakaway, whereas Latour can compete on the steeper climbs and descents. Both will play key roles for Bardet initially first. Alexis Vuillermoz and Domenico Pozzovivo are also names worth a mention, but have both had a quiet 2016. The home crowds will cheer on Pozzovivo, but we think his chances of winning a race like this have sadly been consigned to the past. Tony Gallopin has come into form in the later part of the season. He was second at San Sebastian and won the Grand Prix de Wallonie, however the quick succession of climbs could see him fall off the pace. Tiesj Benoot showed early this year at the Volta Algarve that he can keep pace on the long climbs and could be an outsider to watch. Tim Wellens is a breakaway specialist, but also a decent climber. All three Lotto riders will struggle to keep pace with any explosive attacks from the pure climbers, so they will be looking to launch some attacks to distance themselves. Alberto Contador was today ruled out with flu and Rafa Majka looks set to replace him, so on paper the team isn’t weakened. However Majka’s form since winning bronze at the Olympics hasn’t been great, so we’re not expecting much. On his day Roman Kreuziger, could go well here however, like Majka, since the summer his results havn’t been great. Neither has Michael Valgren Valgren is now not included in the final startlist, but the young Dane could be best placed to take a surprise victory, as he nearly did at Amstel Gold in the spring. Robert Gesink rolled back the years at the Vuelta, which was great to see after a few tough years on and off the bike for the Dutchman. He looks to be Lotto NLJumbo’s best bet here — he was eleventh last year and his best finish was sixth back in 2009. Can the revival continue? Greg Van Avermaet will no doubt be BMC’s lead rider. He’s had his best season in 2016 winning Omloop Het Nieuwsblad, Tirreno Adriatico, a stage at the Tour, Olympic Gold and, most recently, a first and second in the two Canadian one-day races. He’s on form and has shown he can go well when the road heads up hill. Fellow Belgium and double Lombardia winner (2009 and 2010) Phillipe Gilbert might have something to say about that though. Hes gone well in the recent Italian one day races and European road race. After a fairly poor year for his standards, can he sign off his final race for BMC with a win? Fabio Aru has had a stinker of a year in 2016, the one major highlight coming with a stage win at the Dauphine. But again like other riders, he has also found form in the recent Italian one day races with four top tens out the six stages/races he’s entered. No doubt he will be the team leader for Astana and will want to emulate his future ex teammate and national rival Nibali, who also found redemption after a poor 2015 season last year by winning this race. Miguel Angel Lopez and Diego Rosa, who if racing in another team might be seen as favourites for the win. Will be key support men for Aru and we’d expect one of them to head off in he morning break or ignite the race later on with an attack to attempt to split the peloton on the final climbs. Same recent bad PR for Team Sky might either improve or worsen their image with a win at Lombardia! Wout Poels will be wanting to double on his, and the team’s, first monument win at Liège-Bastogne-Liège so they could be on for the first LBL/Lombardia double in the same year. Another team that won’t be around in 2017 is IAM Cycling, though since announcing that they are disbanding the team hasn’t stopped winning! Mathias Frank and Jarlinson Pantano have won stages at the Vuleta and Tour respectively and will be the team’s best hope for a final win. 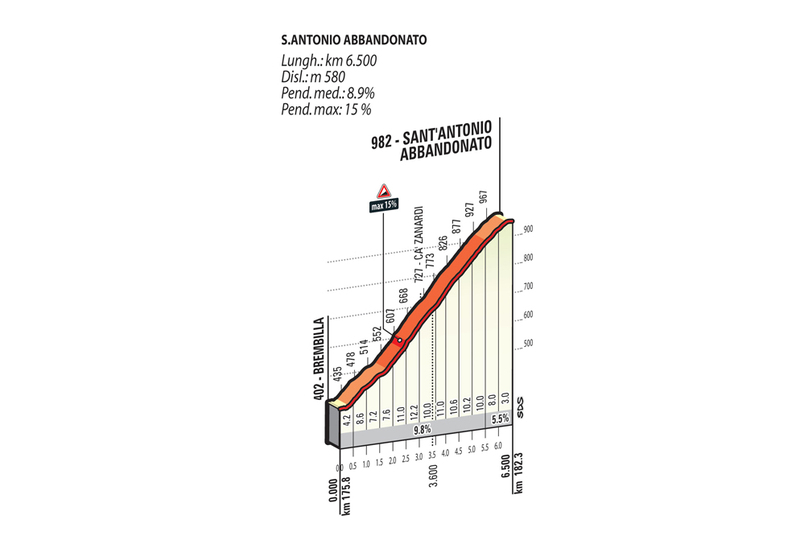 Pantano is a demon on the descents, so we would put him ahead of Frank and a definite outside pick for the win. As mentioned previously, Dimension Data have a fight on their hands to remain in the World Tour next year. They have a strong team, but no riders who would classify as favourites for this race. That said we’d expect them to try something. They could take inspiration from Orica-BikeExchange’s recent fantastic display of disruptive team tactics at the Vuelta to force an upset. We’re looking forward to seeing Edvald Boasson Hagen, Igor Anton, Omar Fraile and Serge Pauwels having a go at trying to pull something special. One final word for (supposedly) retiring Joaquim Rodriguez. He had back to back wins here in 2012 and 2013 and has pushed back his retirement until the end of the season. A DNF at Milano Torino may hint at the true nature of his form, but it would be great to see Purito ‘light up’ a race one last time! Andy is picking Romain Bardet to slip off the front toward the final quarter of the race and have a lone ride last right up until the line, winning by a few metres. Probably. Chris thinks this will be an end-of-season win for Bauke Mollema. Mollema’s been having a great year so far, and has proved himself on terrain not dissimilar to this. He has a great chance of going long and finishing first here. James is predicting Julian Alaphilippe to finally find some joy in a one day race this year! His spring nemesis Valverde is not in the same type of form, and, after a 2nd place in the European road race and 4th at the Olympics, Alaphilippe looks in great form to take a first monument win at Lombardia.